VisitReno.com is proud to provide this Artists Section to showcase many of Reno's fine artists. These artists are among more than 750 local and regional artists in the Sierra Arts Artist Registry. The Registry is available to corporations, schools, churches and other arts organizations to seek an artists(s) for a specific program and to assist the individual artists professionally. The registry also informs artists of local opportunities to exhibit and to receive funding. For more information contact Sierra Arts at 329-ARTS. Click on any image to view it larger. The image will open in a new window. Just close it to return here. Caudill, Jack Born in 1949, in Indiana. Moved to Escondido, CA in 1963. 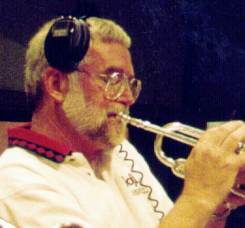 Became a member of the Don Ellis orchestra in 1971 and studied trumpet from Claude Gordon. Recorded a movie soundtrack, The French Connection, several jingles, and two albums with the Don Ellis Orchestra, and traveled with the Osmond Bros for a short time. Moved to Reno in 1971 to play in the Casino house orchestras. I have played in every major casino house band in the Reno, Tahoe area and almost every star. I played 1st trumpet in the "Hello Hollywood Hello" stage show at now the Reno Hilton for over 8 years, until it's close. Started the Reno Jazz Orchestra in 1997 to try and keep quality big band music alive in the Truckee Meadows and to make the band the best of what was left of the house band players with no politics involved, just plainly the best players we could get. I had to make the RJO a non-profit organization under IRS code 501 c 3 in order to keep it going. And did so in 1998. Currently front the band as musical director and lead trumpet player. Also vice president of the RJO board.